Brand new Gok TV for 2016! Me and my bestie, the lovely Fearne Cotton, have a brand new TV show for 2016! Fearne and Gok: Off the Rails is a brand new fashion show looking at celebrity style. The series will run for six 60-minute episodes. Look out for it on ITVBe every Thursday at 10pm! Joining us in the studio each week, two celebrity panelists will be giving their opinion on who rocked the red carpet; who played it safe and who pushed the boundaries when it comes to the celebrity style stakes. The series will also reveal our style secrets of our hosts and those of our celeb guests you’ll get a personal insight into dressing for those big events. Walk-in-wardrobes, high street heroes and last minute fittings for the ultimate designer dress – not to mention the hair, make-up, shoes and accessories that need to be considered during Awards season. The series will be following the highs and lows of celebrity fashion at the must-attend events; from the National Television Awards to the BAFTAs, the Grammys to the Brits. Whether it’s looking at the biggest fashion news stories of the week or road testing some of the more ridiculous trends from the global runways, the emphasis is on fun, as we celebrate the latest and greatest in the world of celebrity fashion. Watch out for news of my other ITV show: Gok’s Lunchbox – Follow the show on Twitter and Facebook for news! Watch me cook live on ITV’s This Morning with Poppa Wan! Gok Wan in The Great Comic Relief Bake Off! Catch up with The Great Comic Relief Bake Off on BBC iPlayer – did I make Comic Relief Star Baker? You’ll have to watch to find out! Find out more on the Comic Relief website. Want to hold your own bake sale for Red Nose Day? Of course you do. 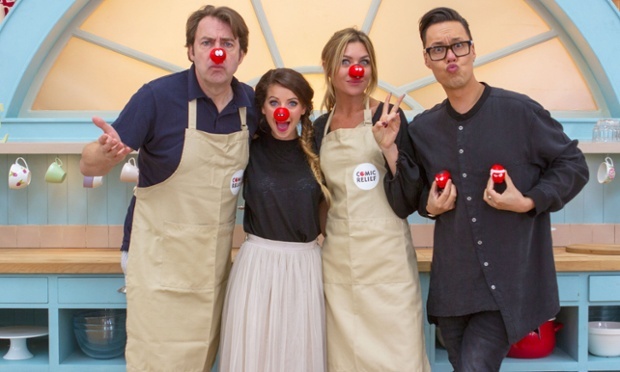 Get all the details at: www.rednoseday.com/bakeoff. I consider my culinary tastes to be quite honest and rustic, however there is a side of my personality that plays to the flamboyant. I love fine dining, but it’s not just about ironed tablecloths and hot waiters. It’s also about carefully choreographed dishes served with precision. But who has the time or patience? This dish screams fine dining but without the hassle or expense. It is hugely dependent on the natural colours of the ingredients: the deepest of greens juxtaposed with the dark speckles of sesame seeds, contrasted with the poached egg. It is worthy of any cover of Vogue – fashion week in a bowl! Poach the eggs for 3–4 minutes in gently simmering water, until the white is opaque and the yolk is just firm to the touch. Place in a bowl of cold water until needed. Chop the stalks of the broccoli into rough 1cm pieces. Heat the oil in a large saucepan over a medium heat. Once hot, add the spring onions, the chopped broccoli stalk and the ginger. Sweat in the hot oil for 1 minute before adding the hot stock, cooked rice and the broccoli florets. Increase the heat and bring to the boil. Add the sugar and simmer for about 15 minutes, or until everything is very tender and !lls apart when pushed lightly with a spoon. Stir in the soy sauce and sesame oil, and then, using a jug or stick blender, blitz until you have a smooth soup. Taste and season with a little salt and pepper if you think it needs it. 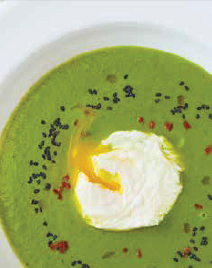 Place a poached egg in the bottom of each soup bowl and pour the soup around the egg. Scatter over the chopped chilli and sesame seeds and drizzle with a little extra sesame oil. Amidst our hectic modern lives, it is easy to put a dinner date in the diary and then completely forget about it until an hour before your guests are due to arrive. With nothing in the fridge apart from half a bottle of wine, you begin wondering how you can dress up a takeaway as a home-cooked meal. Well, fear not, as here is a recipe that delivers maximum flavour using only long-lasting store-cupboard basics and which will be ready in under half an hour. Heat half of the oil in a wok over a medium to high heat. When hot, add the prawns and fry for 2–3 minutes, stirring every now and then, until they have defrosted and turned a delicious coral colour (they won’t be fully cooked at this point). Tip the prawns on to a plate and wipe your wok clean with kitchen roll. Heat the remaining oil in the wok over a medium to high heat. Once hot, fry the onion for 1 minute before adding the garlic, ginger and chillies. Stir-fry for a further minute and then return the half-cooked prawns to the wok. Heat through for 1–2 minutes and then add the beans and peas. Stir-fry the whole lot for a further 2–3 minutes until everything is heated through. Add the remaining ingredients apart from the lime juice and sweet chilli sauce and toss together until well combined. Don’t even mess around plating up this dish, just place the wok in the middle of the table with the lime wedges and chilli sauce, if using, alongside and revel in the eating-induced silence that is sure to fall over your friends. Gok’s Wok – out now! 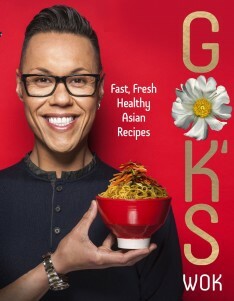 Look out for Gok’s Wok, my brand new cook book stuffed with fast, fresh and healthy Asian recipes. I have absolutely loved developing these recipes for you guys – there are so many dishes to cater for every part of your life – from healthy lunches to tasty, sharing curry feasts, plus ideas for date nights, dinner parties and never-to-be-shared one-pot wonders just for you! Get your hands on a copy in all really, really good bookshops and online too! Plus join me in a fab live cookalong on Weds 16th October – all the details here! 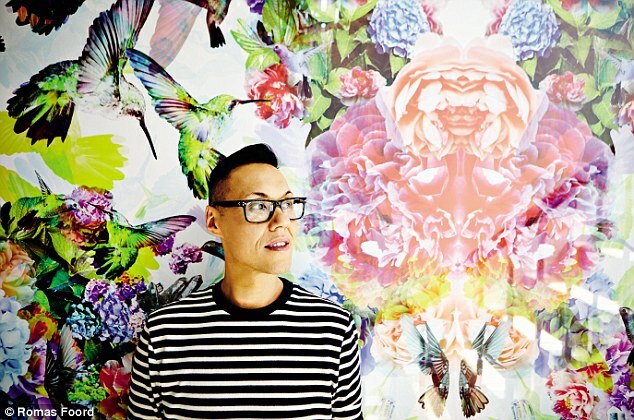 Daily Mail: Gok à la mode: The fashion guru and foodie on the Asian flavours he adores. True love! Gok’s Wok will be published on Thursday by Ebury Press, price £20. 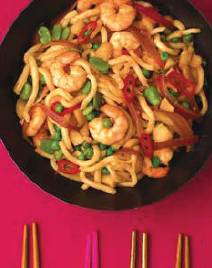 Chapters include Quick & Healthy * Asian Salads* Lunchtime * Asian-inspired Curries* Dinner Parties* Date Night* Stir-fries* Anglo-Asian* Desserts & Goktails. To order a copy for £15.99 with free p&p, contact the YOU Bookshop on 0844 472 4157, you-bookshop.co.uk. To celebrate the release of Gok’s Wok, I have teamed up with Mumsnet and Sainsbury’s to host a live Google+ cookalong on Wednesday 16th October at 7pm! 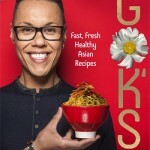 Gok’s Wok – available for pre-order now! Gok’s recipes draw influence from the East, as he teaches us how to add flavour and a splash of originality through his distinctive style of simple, fast cooking. Chapters cover all occasions from lunch ideas to dinner parties and date nights and include curries, stir-fries, noodles, salads, soups and even desserts. He shares many of his family’s traditional recipes too, but gives them a modern twist for today’s kitchen tables – try Shanghai Chicken and Spring Greens, Malaysian-style Prawn and Crab Soup and Spicy Beef Thai Noodles Gok-style. And, running throughout, are Gok’s words of advice on wok cooking, his favourite ingredients and tips on preparation and entertaining Gok-style. For Gok, great eating should be hassle-free, and these recipes are exactly that – tasty dishes that are low stress, good for you and make minimal mess. This title will be released on October 10, 2013. A delicious treat next week – Gok Cooks Chinese is repeated on Channel 4 every afternoon at 12.15pm Monday – Friday (12.40pm on Tuesday).